A digital institution should ensure that it supports the needs of students with disabilities. But how should we go about building an accessible digital institution? 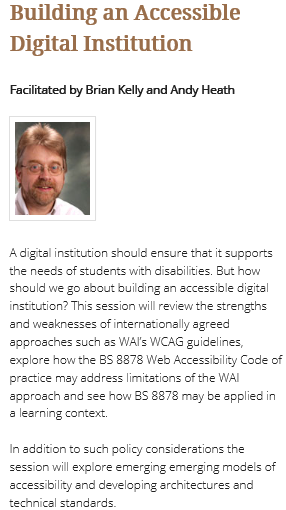 This session will review the strengths and weaknesses of internationally agreed approaches such as WAI’s WCAG guidelines, explore how the BS 8878 Web Accessibility Code of practice may address limitations of the WAI approach and see how BS 8878 may be applied in a learning context. However the numbers attending the session were low. What is the reason for the apparent lack of interest in accessibility of digital resources? What is the reason for the apparent lack of interest in accessibility of digital resources? It may be that universities feel they’ve ‘solved’ accessibility by asking their staff to ensure that content conforms with WCAG guidelines. However, a quick look at the accessibility of many university’s websites is sufficient to indicate that this ‘solution’ hasn’t had the desired effect, which is why I feel it’s important to consider how the BS 8878 code of practice can help to document achievable and realistic ways of enhancing the accessibility of institutional web resources. And perhaps, since the threat of legal action and fines for organisations whose Web content is not accessible seems to have disappeared, there is less of an interest in this area. If that is the case, a new driver is about to arrive, which is likely to result in institutions needing to change their approaches to accessibility – the proposed cuts next year to the Disabled Students’ Allowance (DSA). Under the banner of modernisation, David Willetts has announced measures to cut Disabled Students’ Allowances (DSAs) from September 2015 – grants offered to disabled students to support their studies. Without this funding – a vital support mechanism in recruitment – higher education will no longer be viable for some. For others, cuts will mean persevering without necessary support, leading to higher drop-out rates,dissatisfaction and lower educational attainment. Proposed changes to DSA funding may fundamentally redefine disability in higher education. Students with Specific Learning Difficulties (SpLDs), such as dyslexia, dyspraxia and ADD/ADHD, have been singled out for the largest cuts, and there is a real danger that their needs become invisible. We, the signatories of this petition, hereby urge every UK political party to show commitment to building an inclusive society in which all persons can participate without loss of dignity, including older persons, and persons regarded as having disabilities of any kind, independently of ability or skill, creed, race, gender, sexuality or other characteristic or preference. These cuts, estimated at nearly 70% of the total DSAs budget, will put the studies of disabled students at risk. DSAs currently support 53,000 disabled students, paying for assistive technologies, non-medical assistance and other costs incurred by studying with a disability. It may be that we will see renewed interest in accessibility issues. But beyond signing a petition what else can be done? At the IWMW 2013 event held at the University of Bath a year ago Jonathan Hassell gave a plenary talk entitled “Stop Trying to Avoid Losing and Start Winning: How BS 8878 Reframes the Accessibility Question“. At the end of the talk a show of hands showed that there was significant interest in a dedicated event which explored how BS 8878 could be applied in a university context, in particular how it could be used not only to support the provision of accessible informal resources but also in teaching and learning and research contexts. The announcement to the cuts in the DSA is likely to result in renewed interest in institutional approaches to the provision of accessible web services. Although the numbers attending the Cetis accessibility workshop were low I did receive encouragement to revive Cetis’s work in this area, which had previously been addressed by the Cetis Accessibility SIG. I’m also pleased to say that following discussions with Sarah Lewthwaite (a disability researcher based in London) and Jonathan Hassell (lead author of the BS 8878 code of practice) we have agreed to explore the possibility of further work in this area including running an event of the applicability of BS 8878 in an educational context. If you’re interested in how the forthcoming DSA changes may impact you, and would like to know how you can respond to the changes in a strategic way, please get in touch and we’ll send you information as it becomes available. Each year the Cetis conference provides a unique opportunity for developers, learning technologists, lectures and policy makers to come together to discuss recent innovations in the domain of education technology. This year’s conference focuses on the digital institution and explores how technology innovation can support and develop every aspect of university and college life, for teachers and learners, researchers and developers, service directors and senior managers. The conference will open with a keynote talk from Phil Richards, the Jisc Chief Innovation Officer. The closing talk will be given by Audrey Watters, a Technology Journalist. If you’d like to hear more about Audrey’s talk a 60 second interview ahead of #cetis14 has been published on the Cetis blog. Although the two plenary talks will provide a shared context for participants at the conference the most important aspect of Cetis conferences has always been the parallel workshop sessions. One important aspect to consider when looking to build the digital institution is to ensure that the digital institution is an accessible institution. In the early days of the development of Web-based learning environments the Web accessibility content guidelines (WCAG) developed by the Web Accessibility Initiative (WAI) were felt to provide a framework for the creation of universally accessible Web resources and services. But if institutions need to look before WCAG guidelines, what should they be doing? In the parallel session on Building an Accessible Digital Institution myself and Andy Heath will try to provide answers to this question. In the first half of the half-day session we will review the limitations of the WCAG approach and describe how the BS 8878 standard, with its focus on policies and processes, seeks to address these limitations. We will explore how BS 8878 can be used in the context of e-learning. In the second half of the session we will look at new developments, models and ways of thinking about accessibility. We will welcome brief case studies from participants at the session who may be working in this area. Please get in touch if you would like to contribute. Note that registration details for the Cetis conference are available on the Cetis web site. Earlier today I gave the closing talk at the OZeWAI 2013 conference, which was held in La Trobe University, Bundoora, Australia. However as I was in bed in Bath at the time, I pre-recorded my presentation. I had intended to answer questions using Skype or via Twitter but as I was asleep after having arrived home after a brief holiday in Marrakesh a few hours before the talk was delivered I was unable to do this. The title of my talk is “Accessibility is Primarily About People and Processes, Not Digital Resources!“. In the talk I review approaches developed by accessibility researchers and practitioners in the UK (with some input from Australian colleagues) since 2005 and complementary standardisation work which resulted in the BS 8878 Code of Practice for Web Accessibility. The slides, with accompanying audio, are available on Slideshare and embedded below. The final paper which I’ve written during my time at UKOLN has just been published in the Ariadne e-journal. 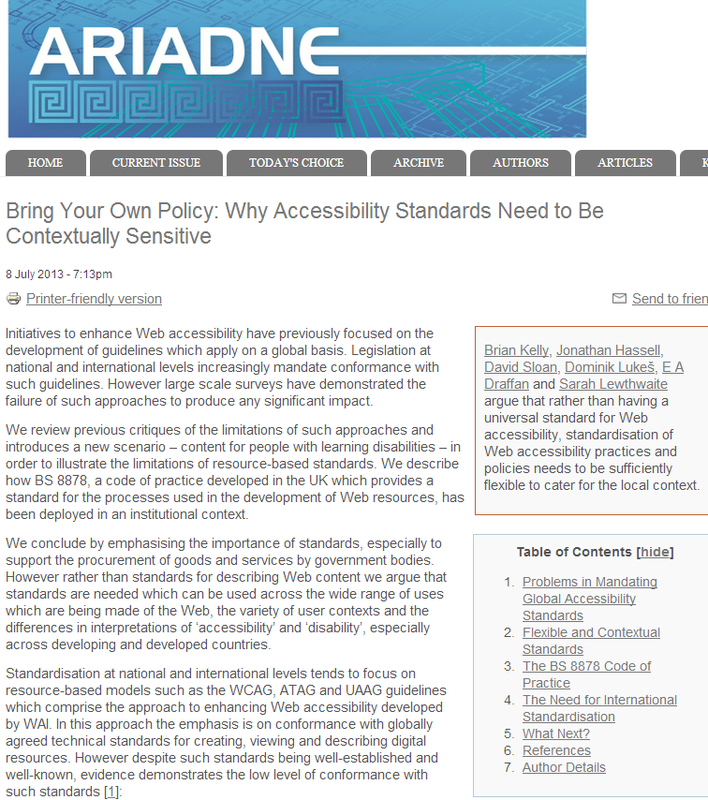 In the article on Bring Your Own Policy: Why Accessibility Standards Need to Be Contextually Sensitive myself, Jonathan Hassell, David Sloan, Dominik Lukeš, E.A. Draffan and Sarah Lewthwaite argue that rather than having a universal standard for Web accessibility, Web accessibility practices and policies need to be sufficiently flexible to cater for the local context. [The authors] argue for a wider application than just to Web content, and that an alternative strategy could be adopted which would employ measures that are more context-sensitive. The authors point out that little attention has been paid to the principles underlying Global Accessibility Standards and that in non-Western environments may even prove to be counter-productive. They highlight the alternative of more evidence-based standards and examine their disadvantages. 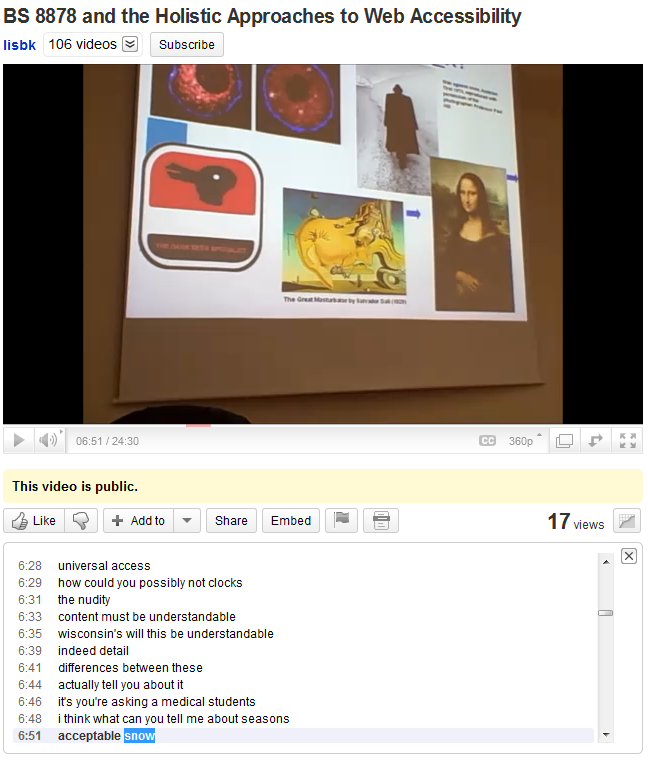 Having used the example of simple language to illustrate the difficulties, the authors offer another example in the provision of accessibility support to publicly available video material. They argue that standardisation of the deployment of Web products is more important that the conformance of the products themselves. The authors summarise the aims of BS 8878. They explain the scope of the framework that it adds to WCAG 2.0 and how it encourages Web site designers to think more strategically about all accessibility decisions surrounding their product. They conclude that globalisation is not limited to users: owners of sites do not wish to be constrained in their choice of international suppliers and products, but the latter are by no means standardised globally – but the benefits of an international standard are enormous. The article follows in an extensive series of peer-reviewed papers which have challenged mainstream approaches to Web accessibility, which typically mandate conformance with WCAG guidelines. This work began with a paper on “Developing A Holistic Approach For E-Learning Accessibility” which was published in the Canadian Journal of Learning and Technology journal in a special issue on E-Learning Standards – Looking Beyond Learning Objects in 2004. A paper on “Forcing Standardization or Accommodating Diversity? A Framework for Applying the WCAG in the Real World” was presented at the W4A 2005 conference. The following year a paper on “Implementing A Holistic Approach To E-Learning Accessibility” coined the term “holistic accessibility” to describe the approaches we had developed. Following a series of papers which explored how such approaches can be deployed in various contexts such as learning and cultural heritage an award-winning paper on “Developing Countries; Developing Experiences: Approaches to Accessibility for the Real World” presented at the W4A 2010 conference provided a socio-political context to this work and including examples of digital accessibility and social exclusion including “Aversive Disablism” and “Hierarchies of Impairment“. I’m pleased that the final paper has been co-authored by David Sloan, my long-standing co-author is this series of papers; Sarah Lewthwaite, a disability researcher who helped to ensure that our work was grounded in disability work which I had previously been unaware of; Dominik Lukeš, whom I first encountered on Twitter last year who provided an insight into the limitations of mandating guidelines for written English; Jonathan Hassell, lead author of the BS 8878 code of practice which embraces many of the approaches described in our previous work and E. A. Draffan who described how such approaches can be implemented in practice. But is this our final paper or simply the most recently published paper? In less than two weeks I will be leaving UKOLN and so will no longer be able to rely of the funding provided by JISC to continue this work. However I hope that the loss of JISC funding will not prevent me from continuing further work in this area. Following Jonathan Hassell’s talk on “Stop Trying to Avoid Losing and Start Winning: How BS 8878 Reframes the Accessibility Question” at the recent IWMW 2013 event a show of hands made it clear that there was significant interest in an event on the implementation of BS 8878 in contexts which are of particular relevance to the higher education sector, including support of teaching and learning and research. I have had discussions with Jonathan on ways in which institutions can implement achievable policies and practices for enhancing the accessibility of their digital products. If you would would be interested in hosting a workshop at your institution or have more general questions feel free to leave a comment on this post or get in touch. On Monday 20 September 2012 the W3C WAI published the Website Accessibility Conformance Evaluation Methodology 1.0 working draft. The W3C invites comments on this working draft which should be sent by 20 October 2012 to public-wai-evaltf@w3.org (note that a publicly visible mailing list archive is available). This is a large document (31 pages when printed) and so I am giving time for those with responsibilities for managing large-scale Web sites to read this document and provide feedback. It should be noted that since institutions may have accessibility policies which claim conformance with WAI guidelines, it will be important that the conformance criteria are realistic and achievable, and that conformance does not add other significant barriers to the provision of institutional Web sites. A website may include areas with smaller collections of related web pages such as an online shop, an area for each department within the organization, a blog area, and other parts. In some situations such areas can be considered to be a full, self-enclosed website each. This methodology can be applied to such individual sub-sites (a website within another website) and to the main website in its entirety. However, this methodology may not be applied to a website excluding any of its parts. Excluding parts of the website from the scope of evaluation would likely conflict with the WCAG 2.0 conformance requirements full pages and complete processes, or significantly distort the evaluation results. In the example above, none of the depicted parts may be excluded from the scope of evaluation in the context of this methodology, if it is to applied to the university website. This includes any aggregated and embedded content such as online maps for the university campus and forms for credit card transactions, including when such parts originate from third-party sources. In order to illustrate the difficulties to be faced in conforming with WCAG 2.0 guidelines, consider the challenges in ensuring full conformance with Principle 3: Understandable – Information and the operation of user interface must be understandable. Yes, in order for an institutional Web site to be conformant with WCAG Level AAA every page, Web pages which contain an abbreviation must provide a mechanism for identifying the expanded form or meaning of abbreviations and for identifying specific pronunciation of words where meaning of the words, in context, is ambiguous without knowing the pronunciation! OK? Or perhaps I should have written “OK (orl korrect)?” as this is one of the possible origins of the abbreviation. I think it is safe to say that no institution should consider stating that its Web site conforms with WCAG AAA guidelines. But will it be possible for any large-scale Web site to conform fully with all WCAG guidelines, including those which are relevant to WCAG A conformance? I would have thought that any Web site which embeds content from third-party services will not be able to guarantee that the embedded content will be conformant. Perhaps it is time to move away from stating conformance with WCAG guidelines and, instead, making use of alternative approaches, with BS 8878 providing an approach to consider for those based in the UK. What do you think? Is it realistic to expect that institutional Web sites will be able to conform to WCAG 2.0 guidelines? What Can Web Accessibility Metrics Learn From Alt.Metrics? 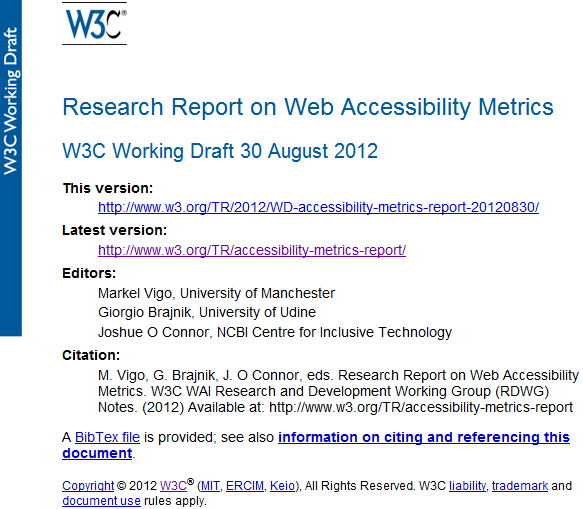 A W3C WAI Research Report on Web Accessibility Metrics, published on 30 August 2012, is currently open for review, with feedback requested by 30 September 2012. Recently, a plethora of metrics has been released to complement the A, AA, and AAA Levels measurement used by the WAI guidelines. However, the validity and reliability of most of these metrics are unknown and those making use of them are taking the risk of using inappropriate metrics. In order to address these concerns, this note provides a framework that considers validity, reliability, sensitivity, adequacy and complexity as the main qualities that a metric should have. A symposium was organized to observe how current practices are addressing such qualities. We found that metrics addressing validity issues are scarce although some efforts can be perceived as far as inter-tool reliability is concerned. This is something that the research community should be aware of, as we might be making efforts by using metrics whose validity and reliability are unknown. The research realm is perhaps not mature enough or we do not have the right methods and tools. We therefore try to shed some light on the possible paths that could be taken so that we can reach a maturity point. In the light of our involvement in last year’s research symposium we intend to respond to the W3C’s request for feedback on the Research Report on Web Accessibility Metrics. It should be noted that responses must be submitted by 30 September 2012 to the public-wai-rd-comments@w3.org list which has a publicly visible mailing list archive. I am therefore posting some thoughts on this blog in advance of that date in order to get feedback before making the formal response. Section 1.2 of the report is entitled The Benefits of Using Metrics. This section should, I feel, be followed by a section on The Risks of Using Metrics. It would be useful to base such a section on the experiences gained in other areas in which metrics are being developed. Areas in which useful comparisons could be made include metrics for online reputation (i.e. services such as Klout) and assessment of research impact (e.g. alt.metrics); in both of these areas the potential benefits of metrics have been identified, but their limitations are also acknowledged. First, it’s important to note that the point of altmetrics isn’t to suggest that it may be possible to use any measures of impact or influence to fully judge the merit of individuals. Citations, tweets, bookmarks, etc are all indicators of influence, but influence isn’t merit. The second point is addressing Stevan’s comment about coupling metrics to real positive outcomes. Science Exchange, Mendeley, PLOS, and Figshare have joined together and launched the Reproducibility Initiative, which aims to provide a positive incentive for doing work that’s robust and reproducible. Such approaches are needed in the development of metrics for Web accessibility. But we should be clear about what is being measured. Is the work in identifying areas of research aiming to develop ways of measuring conformance with Web accessibility guidelines, such as WCAG. Or is the aim to develop metrics which relate to real-world experiences of people with disabilities seeking to make use of Web products? Employing metrics whose validity and reliability is questionable is a very risky practice that should be avoided. We therefore claim that accessibility metrics should be used and designed responsibly. The statement that “accessibility metrics should be used and designed responsibly” is meaningless as nobody would argue that “accessibility metrics should be used and designed irresponsibly“! The report needs to be clear about the reasons why Web accessibility metrics are being developed and who the beneficiaries of such work would be. The development of an international standard for Web accessibility metrics might benefit large software vendors, which would have a global market for selling tools for measuring conformance with such standards. There might also be benefits for organisations which would like to be able to display a badge demonstrating conformance with such standards. But what are the benefits for the user community, especially users with disabilities? In addition there is a need to consider the risks in developing Web accessibility metrics. Might the development of such metrics lead to organisations failing to provide Web services if they failed to conform fully with such metrics, even if such services may still be of value to people with disabilities? I’d welcome your comments, but more importantly, I’d encourage people with an interest in this area to respond to the call for comments by sending a message by 30 September 2012 to the public-wai-rd-comments@w3.org (note this list has a publicly visible mailing list archive). A recent post on IWMW 2012: The Movie described how the accessibility of individual resources, such as a set of slides and a video recording of a talk, can be enhancing by bringing together such related resources, rather than having to implement WCAG guidelines on the individual resources. A related approach to enhancing accessibility by focussing beyond the digital resource could be images of an event. The IWMW 2012 photographs hosted on Flickr, for example, can enhance one’s long-term memory of an event by triggering memories of iconic aspects of an event. 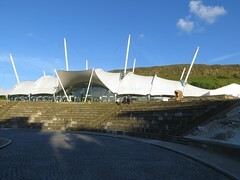 For me, the trip to Our Dynamic Earth was a highlight, and I’m pleased that Sharon Steeples took such a great photo of it, one of her many great photos of IWMW 2012, as illustrated at the top of this post. 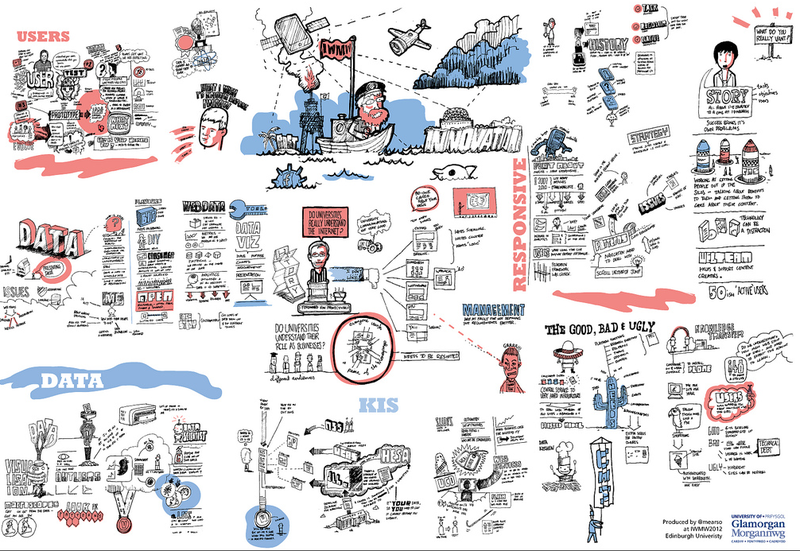 But would it be possible to have a single image which depicted the three-day IWMW 2012 event? Well Kevin Mears (@mearso) has risen to that challenge! This image is embedded at the bottom of this post – and note that it can be viewed on Flickr at a number of sizes including 1600×1132. 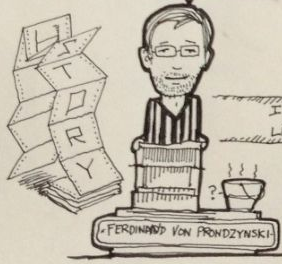 I suspect that looking at the details of the sketch will bring back memories which would not have been the case from a factual summary of the talk – the drawing (shown) of the line printer paper in the sketch of Ferdinand von Prondzynski‘s somewhat controversial plenary talk brought home the point about the somewhat rather protracted introduction in which the speaker sought to establish his credentials as an experienced user of IT. Or to put it another way, images can be a valuable way of enhancing one’s understanding and recollections of things that happen in the physical world. And to think that some people would ban such images unless they were accompanied by a comprehensive textual summary of every element of the sketches! The Wilson Review states that “Networking between universities & the business community is a critical component of an efficient innovation ecosystem” (point 7 in the Executive Summary). This is equally true for networking across institutions for those with responsibilities for the provision of institutional Web services across the sector. As I highlighted in the Welcome talk at UKOLN’s IWMW 2012 event senior managers in institutions are quite capable of using Google to search for “outsourcing web management“ and looking for alternative providers of such services. But rather than pretend that this couldn’t happen at the event we explored how sharing of expertise, knowledge, advice and support can help to provide cost-effective approaches to the management and development of web services across the sector. Yesterday an article on the BBC News on TEDGlobal: Net opens up era of radical openness described a “call-to-arms for corporations to work in more open ways” . In the context of conferences, workshops and other events in the higher education sector such openness is being seen in the provision of amplified events in which, as described in a recent post the sharing of resources at conferences and other events need no longer be restricted to those who were able to be physically present. The ideas shared, criticisms expressed and visions for the future made by plenary speakers at the IWMW 2012 event can now be seen by those who did not happen to be physically in a lecture theatre in the Appleton Tower at the University of Edinburgh during 18-20 June 2012: the videos of the plenary talks have now been processed and uploaded to the UKOLN Vimeo account. 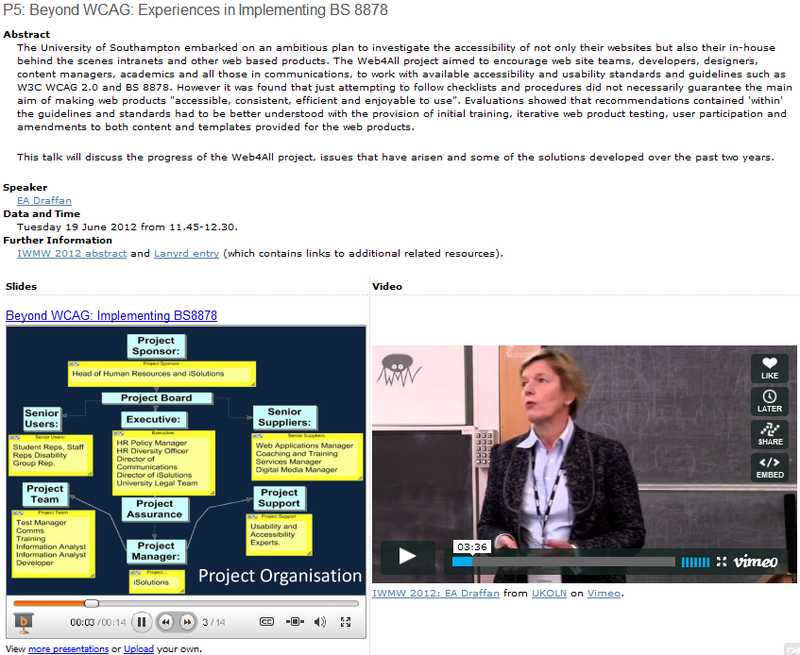 In addition a page on the IWMW 2012 Web site provides access to the embedded videos together with the accompanying slides. As illustrated in the screenshot shown below the page on the IWMW 2012 web site allows you to view a video recording of a talk whilst simultaneously scrolling through the speakers slides. This provides an interesting aspect on accessibility: the slides and the video recording in isolation will have limitations in maximising one’s understanding of the individual resources, but brought together it can be easier to understand the points the speaker is making of the text and images displayed on a slide. It is. of course, not coincidental that the image I have used to illustrate this point is taken from the talk on “Beyond WCAG: Implementing BS 8878” given by EA Draffan. And for those in the audience who were distracted by the person fainting during the talk, the slides and video recording provide an opportunity to revisit the presentation. 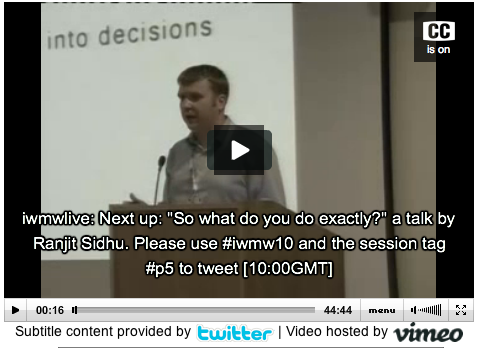 Streaming of IWMW 2012 Plenary Talks – But Who Pays? The sixteenth in the series of annual Institutional Web Management Workshops, IWMW 2012, is now underway. As we were concerned last year that Web team budgets and pressures of work would make it difficult for people to attend a 3-day event, the IWMW 2011 took place over two days. However the feedback we received in the final session last year made it clear that there was demand for the event to revert to its traditional 3 day format. Since the concerns about budgets and workloads will probably be even more valid this year we were still concerned about the number of delegates. However, following an influx of last minutes bookings, the final numbers are even larger than last year with 170 registered delegates. We also have a number of sponsors again this year, with Jadu sponsoring the badges and lanyards, TERMINALFOUR are sponsoring a parallel session and Siteimprove providing inserts in the delegate pack. In addition Statistics into Decisions and Gas Mark 8 are co-sponsoring the event amplification and video-streaming of the plenary talks. Since the University of Edinburgh video-streaming service has other commitments this week, TConsult, who have provided event amplification at IWMW events in the past, will this year also be providing the video-streaming service. The ustream.tv service is being used to deliver the live video stream. However since we are aware that viewers will probably not appreciate the adverts include in the free version of the service, we will be using Watershed, the premium version of the service. The charging for this service is based on viewer hours. Looking at the pricing options it seems that we can pay $49 for a month’s subscription, which gives us 500 viewer hours, with an additional $0.49 per additional viewer hour. This seems reasonable – unless the plenary talks attract a large audience. Since there are 8.5 hours of plenary talks we will be able to cater for 60 people watching all the plenary talks. Based on previous year’s experiences the expected numbers should fall within the standard allowance. However if some of the talks become unexpectedly popular – and the popularity which can be generated by viral social networks such as Twitter – we could be hit with a large bill. We have therefore put a cap on the total number of users. In order to ensure that people who wish to watch a plenary talk do not have access blocked we ask that people watching the live video stream switch off the live stream when the talks they are interested in has finished. These considerations lead to the question: who should pay for live streams at conferences? At recent IWMW events the live video streaming was provided as part of the service by the host institution. However this year we have had to address the question of the business model for the provision on the service for the first time. Although we are providing access to an ad-free video-streaming service we cannot commit to doing this in the future. One alternative will be to make use of the free ad-supported version of the service. As illustrated, when you join a stream an advert will be displayed, for about 20 seconds, it would seem. Adverts which are used to fund a video service which is free at the point of delivery is, of course, something we are all familiar with – ITV have been doing this for many years and we are all willing to watch programmes on commercial channels, provided the content is of interest to us. I would be interested to hear from people who would not be willing to watch video streaming of content of interest to them on how the costs of the service should be provided. I would, of course, expect such suggestions to be reasonable and feasible: saying that we should simply be getting more money to provide such services is not realistic in the current environment. 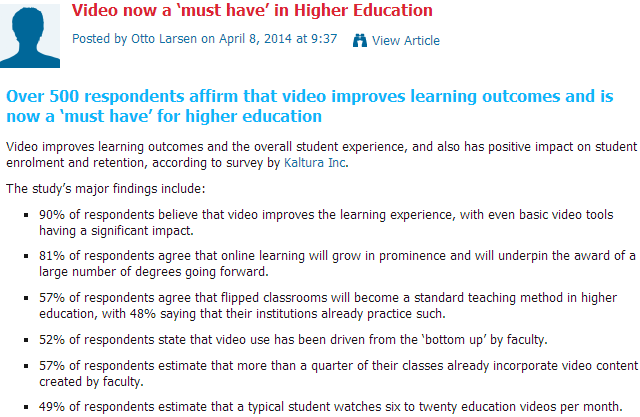 A similar question could be asked about the accessibility of recordings of the videos. We do not intend to provide captions for the recordings and, since legislation talks about ‘reasonable measures’ we do not feel there is a legal requirement to do this. 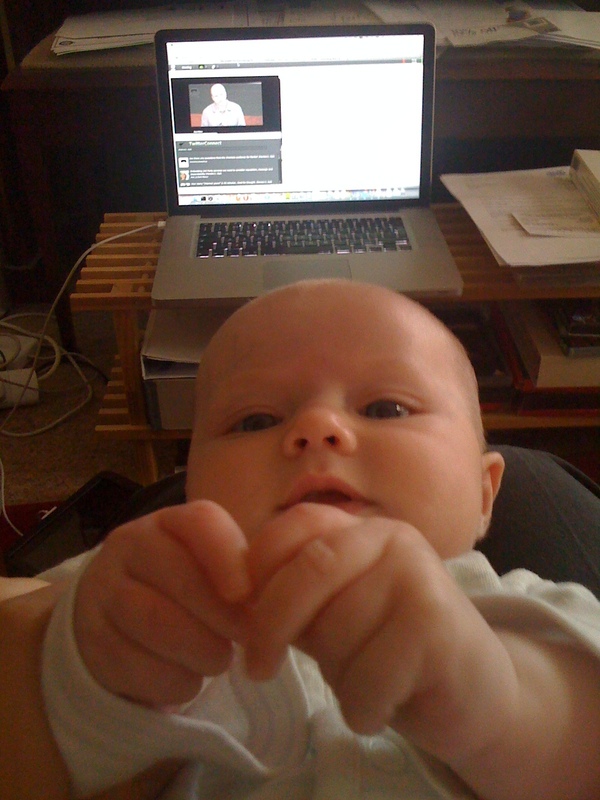 We feel that the provision of the live video stream itself enhances the accessibility of the event – a point brought how to me last year when Janet McKnight uploaded a photo of herself watching the live video stream, with her baby in her lap (as illustrated). Put simply, the provision of the live video stream itself enhances access to the content for people who can’t attend the event for a variety of reasons. Having to spend additional money from an undetermined source to caption the videos would potentially undermine the provision of the live video stream itself, forcing us back to the world of siloed conferences in which only paying delegates could participate. Unless, of course, we could make use of the textual summaries of the plenary talks provided by the official event amplifier on her Twitter account. We did this at IWMW 2010, as can be seen from the accompanying image of the Twitter captions of the talk by Ranjit Sidhu. This will be an approach we will explore again at this year’s event. I ‘ll conclude this post by summarising the policy for video streaming and access to video recording of talks at IWMW events. In order to maximise the impact of the ideas presented in talks at IWMW events we will seek to support event amplification to enable members of the sector who aren’t physically present to engage in the discussions and sharing of ideas. We will also seek to provide a live video stream of plenary talks and access to recordings of the talks after the event. We will aim to provide these services in a sustainable fashion. We will be transparent about the ways in which these services are being funded. Is that a reasonable policy? The final preparations for UKOLN’s IWMW 2012 event included booking a ceilidh band for the evening social on the opening night of the event. This had been left until just over a week before the event as we were unsure of the numbers we might get in light of limited budgets for people to attend such events. However I’m pleased to say that the event will be even larger than last year with approximately 170 delegates. 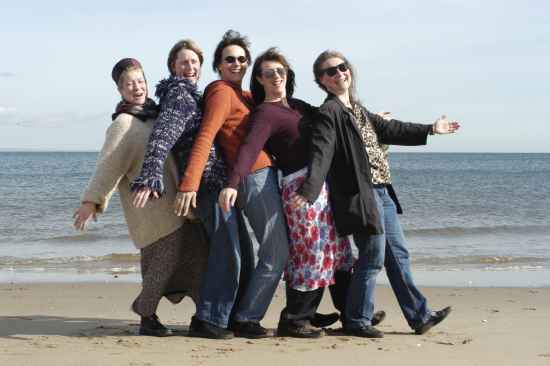 “One of Scotland’s top all-women dance bands, The Belle Star Band have got to be unique in spanning three cultures – Scottish Urban Ceilidh, Jewish Klezmer and Canadian/American Contradance. Their great sense of swing, strong fiddle-driven sound and love of playing for dancing make them the glue in any social gathering“. Wow! Yes. Blast from the past! That was good enough for me, and we have now booked The Belle Star for Monday night’s ceilidh. The Twitter account which helped me make this decision was @disabilityarts. As Web accessibility is an important area of my work I was interested in finding out more. From the Twitter biography I found that “DAO is a journal for disabled bloggers, creatives and performers to share work and experience. Tweets are from Marian (sub-editor) and Colin (editor)“. “’Accessible’ means ‘something everyone can use.’ In pop culture and consumer technology, “accessible” sometimes means things that are easy for lots of people to understand or enjoy. This view of accessibility clearly has parallels with the W3C WAI’s approach to Web accessibility for which the mantra, expressed by Tim Berners-Lee is “The power of the Web is in its universality. Access by everyone regardless of disability is an essential aspect“. 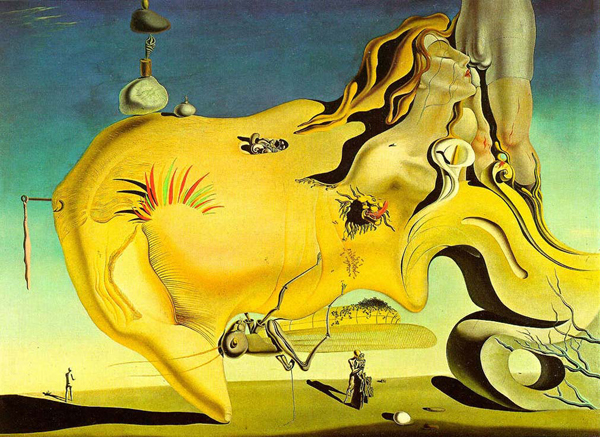 But just as we wouldn’t expect all works of art to be accessible to all, we should also not expect all Web products to be accessible by all. Back in 2004 myself, Lawrie Phipps and Elaine Swift realised that the accessibility of Web resources shouldn’t be the prime consideration for elearning resources. In a paper entitled “Developing A Holistic Approach For E-Learning Accessibility” we argued that the important aspect was the accessibility of the learning outcomes, not the digital resources. The “understanding” of the content may come about through a particular pedagogical approaches, such as Social constructivism in which, according to Wikipedia “groups construct knowledge for one another, collaboratively creating a small culture of shared artifacts with shared meanings“. The technology is there to be exploited, to be harnessed, to be pushed. Simon Mckeown is a disabled artist who has spent much of his working life within the commercial world of gaming and computer animation and so knows a thing or two about pushing at boundaries. But is this video accessible to a blind user? Does the web site conform with WAI accessibility guidelines? The answer is no. And this illustrates that the focus on conformance of the digital resource with a technical checklist is an over-simplistic approach to enhancing accessibility. For me it is now timely to go the mechanistic approach to web accessibility and move towards a ‘post-digital’ view of accessibility which we touched on in a paper on Web accessibility metrics for a post digital world. The article on “Digitising Disability” went on to explain how “The technology is there to be exploited, to be harnessed, to be pushed“. Let’s take One Step Beyond the simplicities of a checklist approach to accessibility. That step should be based on an understanding of what accessibility means from those engaged in disability studies and seeing how this might be applied in an online environment. We have recently been asked to provide evidence of the usage and impact of the diverse services we provide. Such a request is perfectly understandable – commercial companies with be able to point to their profit margins as evidence of the effectiveness of their activities and whilst ways of doing this for those working in higher education will be more complex, I appreciate the need to do this. This example made me realise that the velocity as well as the overall usage statistics – coincidentally my most viewed slides on Slideshare, Introduction To Facebook, have also been viewed over 20,000 times – but this has been over a period of four years. Whilst such usage statistics can be relatively easy to gather (and I will leave it to others to interpret the metrics), it can be more time-consuming to gather qualitative evidence of the take-up of services. On Friday, however, I noticed an incoming link which was sending traffic to this blog. The link was from the eGovernment Resource Service for the Victoria Government, Australia and related to a post on Aversive Disablism, Web Accessibility and the Web Developer which I posted on 1 May 2012, the Global Accessibility Awareness Day. It then occurred to me that having a blog post embedded in a government’s web site might be a useful indicator of the value of my work in the area of web accessibility. Further investigation I found addition pages on the web sites about an article I had written on Web Accessibility: Putting People and Processes First and a paper on Forcing Standardization or Accommodating Diversity? A Framework for Applying the WCAG in the Real World. As described on the Web site “the eGovernment Resource Centre provides access to the Victorian Government body of knowledge on eGovernment, government 2.0, government use of social media and information and communications technology (ICT) and government website best practices, with Australian and international examples“. It does seem to me that I will be able to use this as an example of the impact at an international level of my work. I also realised that I would not have been aware of this if I had not seen the incoming link to the blog post. Blog posts, it would seem, can act as a magnet for attracting evidence of impact which would be difficult to detect otherwise. I then went on to wonder why the Victorian Government in Australia was aware of my work. I then remembered that in January 2009 I gave the opening plenary talk on “From Web Accessibility 2.0 to Web Adaptability (1.0)” at the OzeWAI conference in Melbourne and in November 2009 gave a plenary keynote talk, provided as a pre-recorded slidecast on “From Web Accessibility To Web Adaptability” at the OzeWAI at OZCHI 2009 conference”. Perhaps the connections I made in the first trip and the followup talk I gave ten months later made an impact which I have only become aware of recently? Meanwhile, back to the gathering of further evidence …. Today’s event therefore provides a valuable opportunity to highlight important work in the area of Web accessibility which has been developed in the UK and is relevant to a worldwide audience. There will be little need to raise the profile of the work of WAI, the Web Accessibility Initiative and the guidelines they have developed to help enhance the accessibility of Web resources: the Web Content Accessibility Guidelines (WCAG) which describe how web content, including native W3C formats such as HTML as well as formats such as Flash and PDF which may be included on Web sites, should be defined in order to enhance access by people with disabilities who may be using standard Web browsers or assistive technologies which should support the User Agent Accessibility Guidelines (UAAG) Creators of Web content should be using authoring tools which are based on ATAG, the Authoring Tools Accessibility Guidelines, which will help to ensure that the content is WCAG-conformant. Unfortunately experience has shown that this simple model is insufficient for developing Web products which reflect the diverse ways in which the Web is used today. As summarised in a paper on “Reflections on the Development of a Holistic Approach to Web Accessibility” the reasons for this include limitations in the guidelines themselves, limitations of the three-part model, the inappropriateness of an approaches based on universal accessibility for services which may be targetted at specific groups of users or even an individual user and the lack of guidance in the WAI approach on ways of providing ‘good enough’ accessibility as opposed to WAI’s ‘just-in-case’ approach. To give an example of the need to be able to develop ‘good enough’ solutions, if an institution’s institutional repository contains many thousands of research papers in PDF format and the PDFs, which may be deposited by the author, do not conform with accessibility guidelines, should the repository service be discontinued? This paper describes an empirical study of the problems encountered by 32 blind users on the Web. Task-based user evaluations were undertaken on 16 websites, yielding 1383 instances of user problems. The results showed that only 50.4% of the problems encountered by users were covered by Success Criteria in the Web Content Accessibility Guidelines 2.0 (WCAG 2.0). For user problems that were covered by WCAG 2.0, 16.7% of websites implemented techniques recommended in WCAG 2.0 but the techniques did not solve the problems. These results show that few developers are implementing the current version of WCAG, and even when the guidelines are implemented on websites there is little indication that people with disabilities will encounter fewer problems. The paper closes by discussing the implications of this study for future research and practice. In particular, it discusses the need to move away from a problem-based approach towards a design principle approach for web accessibility. But if WCAG has failed to live up to its expectations, is it no longer relevant? We disagree with this view – rather there is a need for a higher level standard which provides a context for use of WCAG and other accessibility standards. These steps span: initial conception and requirements analysis (steps 1 to 6); strategic choices based on that research (steps 7 to 11); the decision to procure or develop the web product either in-house or contracted out (step 11); production of the web product (steps 12 and 13); evaluation of the product (step14); the launch (step 15); and post-launch maintenance (step 16). This model has been drawn up based on real-world experience in companies and organisations that have effectively addressed accessibility. 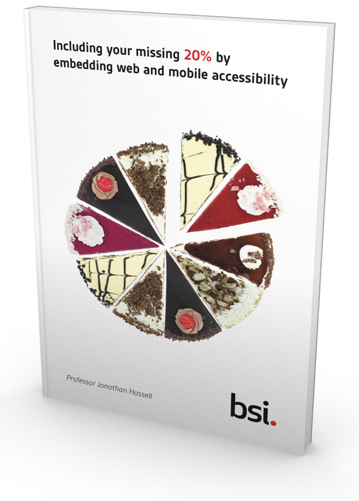 BS 8878 addresses accessibility both at the organisational level and the individual product level. It needs to be adapted to any situation it is applied. Brian Kelly attended the launch meeting for WAI in April 1997 and has been active in promoting best practices for Web accessibility ever since. Initially the focus of his work was in promoting take-up of WCAG guidelines across the UK’s higher and further education sectors. However following feedback from those involved in developing of web-based elearning services, it became apparent that use of WCAG guidelines was not always appropriate in the context of e-learning development work. A paper on “Developing A Holistic Approach For E-Learning Accessibility” published in the Canadian Journal of Learning and Technology in 2004 introduced the idea of ‘holistic approaches’ to web accessibility. The limitations of WAI’s approaches were described in a paper on “Forcing Standardization or Accommodating Diversity? A Framework for Applying the WCAG in the Real World” which described how “the context of the Web resource in question and other factors surrounding its use are used to shape an approach to accessible design” was published in 2005. A paper on “Implementing A Holistic Approach To E-Learning Accessibility” was awarded a prize for Best Research Paper at the ALT-C 2005 conference. The importance of context was described in a paper on “Contextual Web Accessibility – Maximizing the Benefit of Accessibility Guidelines” which was presented at the W4A 2006 conference. The importance of development of policies and accompanying processes to support user-focussed approaches to Web accessibility were described in a paper on “Accessibility 2.0: People, Policies and Processes” presented at the W4A 2007 conference. A review of work to date was given in a paper on “Reflections on the Development of a Holistic Approach to Web Accessibility” presented at the ADDW08 conference. The need to adopt alternative approaches to Web accessibility was described in papers on “Accessibility 2.0: Next Steps For Web Accessibility” published in the Journal of Access Services and “From Web Accessibility to Web Adaptability” published in the Disability and Rehability: Assistive Technology journal, both published in 2009. Insights from disability studies were included in a paper on “Developing Countries; Developing Experiences: Approaches to Accessibility for the Real World” presented at the W4A 2010 conference. 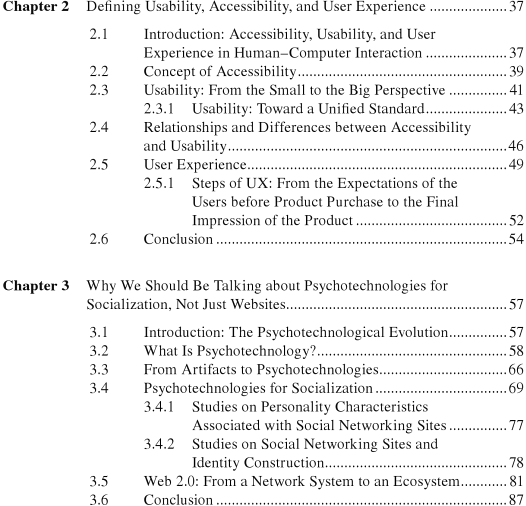 The limitation of accessibility metrics were addressed in a paper “Web Accessibility Metrics For A Post Digital World” presented at a W3C WAI online symposium in 2011. These ideas were further developed in a post on “A Challenge to Web Accessibility Metrics and Guidelines: Putting People and Processes First” presented at the W4A 2012 conference. 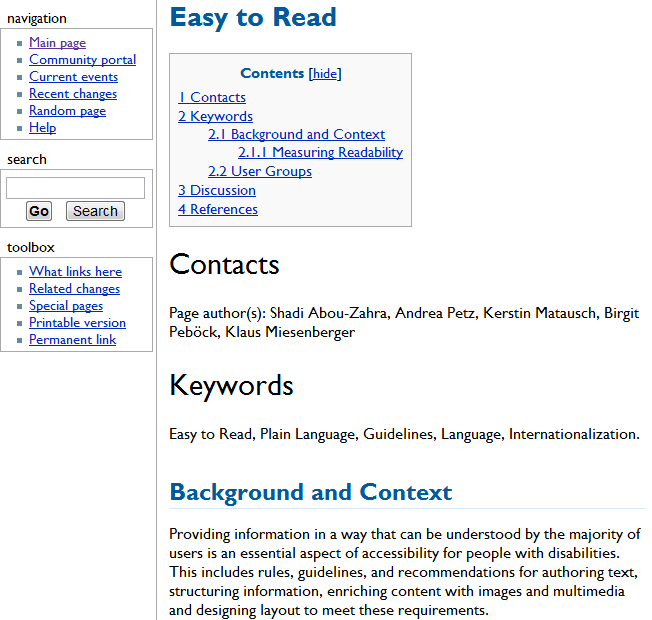 These, and other peer-reviewed papers on Web accessibility can be accessed from the UKOLN Web site. Sarah Lewthwaite introduced me to the term “adversive disablism” a couple of years ago when we had a brief discussion on Twitter and I was motived to follow the link to her (old) blog. Following a subsequent discussion Sarah drew my attention to a post she had written on Web Development and Aversive Disablism. I quickly realised that Sarah’s expertise in disability theory added a new dimension to the Web accessibility research papers which David Sloan and myself, together with several other disability researchers and practitioners had published since my first paper, on Developing A Holistic Approach For E-Learning Accessibility, was published in 2004. Blatant forms of discrimination and prejudice towards disabled people appear to be declining in the UK and elsewhere. As such, it is not always clear how or why inequality persists, particularly online where disability could become a matter of relevance, rather than definition. To understand this phenomenon, it is useful to consider Mark Deal’s concept of Aversive Disablism: ‘Aversive disablists recognise disablism is bad but do not recognize that they themselves are prejudiced‘ . Where aversive racists are not anti-black, but pro-white , aversive disablists may not be anti-disabled, but rather pro-non-disabled. This disablism, is often unintentional. In terms of Web development, significant inroads are being made through legislation, education and advocacy, but aversive disablism can and does persist at many levels. Importantly, since Web 2.0 thrives upon user-generated content and social interactions which are propagated and remixed across media, there are a multitude of levels and opportunities for aversive disablism to become integrated within systems. I insist that Web pages must validate. We don’t make videos available unless they are fully-captioned. We will only use HTML as a document format on our web site. The vast majority of Web pages do not validate with formal HTML standards, but this is not necessarily a barrier to accessibility, especially for trivial HTML errors such as unescaped & characters. Videos may be valuable for users with disabilities and to deprive such users of access to these videos due to a lack of resources to fund captioning may be a barrier to these users. Institutional repositories currently host primarily PDFs of peer-reviewed papers. Insisting that an accessible HTML equivalent of such resources must be published will be a severe barrier to the implementation of open access policies. We might then conclude that such disablist approaches may have been taken by people who regard guidelines such as the Web Content Accessibility Guidelines (WCAG) as a set of inflexible rules which must be applied at all times or who may interpret legislation as mandating conformance with such guidelines and are unwilling to take a risk that such an interpretation is mistaken. But in addition such disablist approaches may also be taken by those so immersed in the Web environment, that they fail to appreciate the benefits for people with disabilities of blended approaches, as illustrated in a post on Videoing Talks As A Means Of Providing Equivalent Experiences. As we described in our most recent paper, the challenge for policy makers and developers involved in Web activities is to ensure that they put people and processes first. I would hope that such user-focussed approaches are the norm. However a post which asks Is PDF accessible in Australia? argues that “it is time the Australian Government Information Management Office and the Human Rights Commission fully embrace both the spirit and the recommendations of WCAG 2.0” which can only be met by use of the following technologies: XHTML1, HTML 4, HTML5. Implementation of such a policy would seem likely to result in significant new barriers to researchers including, ironically, barriers to researchers with disabilities. 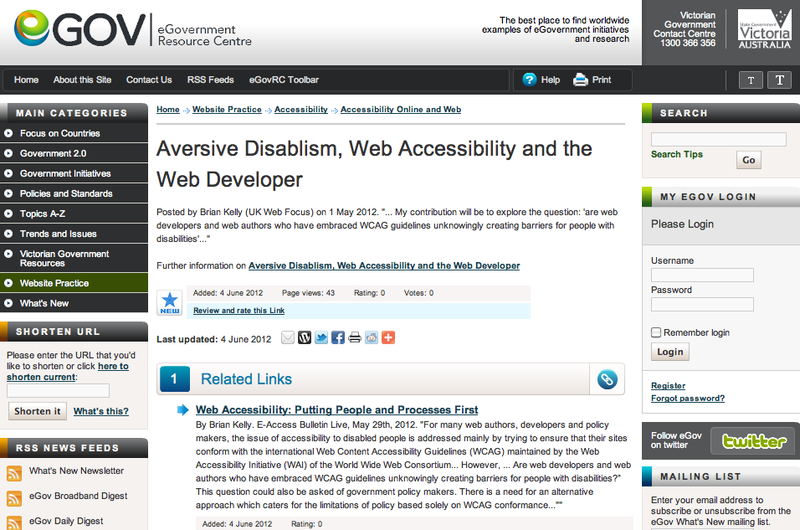 To revisit the question I posed at the beginning of this post: “are web developers and web authors who have embraced WCAG guidelines unknowingly creating barriers for people with disabilities?” Might not those with understandable motives in developing a more elegant, robust and open Web environment hinder access to resources for people with disabilities who are living in today’s environment of flawed tools, complex business models and, perhaps, over-ambitious accessibility guidelines? And if your response is that adopting WCAG has been better than doing nothing, that may have been the case when our understanding of web accessibility was limited. But now we have a better understanding of how WCAG can be applied in a pragmatic way – and in the UK we have BS 8878 which we can – should – be using as a standard. 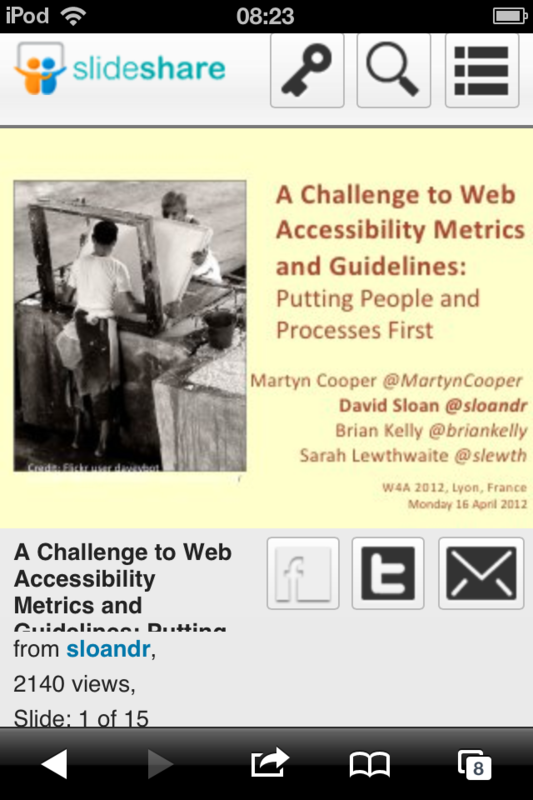 On Monday 16 April 2012 David Sloan presented our paper on A Challenge to Web Accessibility Metrics and Guidelines: Putting People and Processes First at the W4A 2012 conference. The slides David used were uploaded to Slideshare in advance of his talk, so that the remote audience watching the live video stream would be able to have a better view of the slides that would be the case if only the video stream was available. Such an approach can clearly help to enhance access to the resource by those who were not present at the conference. In addition this can mean that the slides can also be viewed on a mobile device by conference attendees who might have difficulties in viewing the screen display. Use of Slideshare would therefore appear to be very relevant for a conference such as W4A 2012, the 9th International Cross-Disciplinary Conference on Web Accessibility, which seeks to understand innovative ways of enhancing access to web resources for people with disabilities. However in my experience such process-driven solutions tend not to be overlooked, especially by those who regard conformance with WAI’s WCAG guidelines as the definitive solution for enhancing web accessibility. Our paper challenged such views by arguing that “web accessibility is not an intrinsic characteristic of a digital resource but is determined by complex political, social and other contextual factors, as well as technical aspects which are the focus of WAI standardisation activities. It can therefore be inappropriate to develop legislation or focus on metrics only associated with properties of the resource.” In addition to legislation and metrics we could well have added policies, not only for institutions but also for event organisers. The paper (which is available in MS Word, PDF and HTML formats) proposed that BS 8878 provides an relevant standard for ensuring that appropriate processes are being addressed and provided a case study from the Open University which illustrated how learning analytics can be used to help identify problems being experienced by students with learning difficulties (which might include difficulties experienced which are due to problems beyond conformance with WCAG guidelines) and suggest appropriate interventions. We will seek to ensure that slides used by speakers in presentations will be made available on Slideshare (or equivalent service) so that the slides can be viewed by delegates on popular mobile devices (including Apple iPhone/iPad and Android devices) . This will help participants who may have difficulties in viewing the screen display provided at the event. This suggestion, which focusses on the processes needed which can provide clear benefits to an identified user community, is itself an example of the ideas described in the paper which argue that WCAG conformance is simply one part of a much wider set of issues which need to be considered when addressing accessibility issues. Unfortunately, as we mention in the presentation “If organisational policy focuses exclusively on technical guideline conformance, there [is] a risk accessibility efforts can be mis-focused“. It should be noted that the “seek to ensure” wording is used as it is appreciated that this may not also be possible: speakers may not use a desktop presentation software such as PowerPoint or may be presenting confidential or sensitive information which would not be appropriate t0 publish openly. The slides are available in Slideshare and embedded below. I should also add that by the end of the third day of the conference there had been over 2,000 views of the slides. Note bad for a presentation given to an audience of about 60 and an example of how the potential benefits provided to remote users and local users may also help in raising awareness of the ideas outlined in the paper. These figures also illustrate the benefits of uploading the slides in advance with, at the time of writing, only two other slideshows have been uploaded (although two additional slideshow have been tagged with the w4a2012 tag). These were uploaded after David’s and have been viewed 5 and 316 times, perhaps because the buzz generated by the #w4a12 tweets had dissipated after delegates went home after the event. 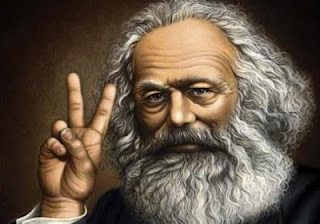 Are You a Marxist in Your Approaches to Research? From my point of view I have been involved in various aspects of research for which the purpose of the research is to identify and develop best practices – and the purpose of this work is for such best practices to be embedded by practitioners. If the research output is seldom downloaded from an institutional repository (or, worse, is hidden behind publisher’s paywalls) it will be difficult for the work to achieve the goal of developing understanding and informing practice. Promoting the research is therefore, for me, an essential aspect of a researcher’s activities. In a review of How to Change the World: Tales of Marx and Marxism by Eric Hobsbawm published in The Guardian suggested that “Marx’s celebrated over-statement attempted to build what might now be called an ‘impact requirement’“. This suggests that Marx’s quote may continue to be applicable in today’s research environment in which society expects to see evidence of the benefits of work which society (the tax-payer or the student fee-payer) pays. But if, like me, you feel that researchers have some responsibility in seeing ideas produced through research processes, how might this be done? 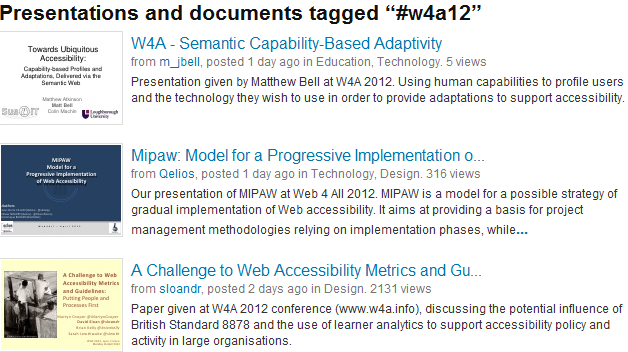 Last month a post on this blog described a Paper Accepted for #W4A2012 Conference. 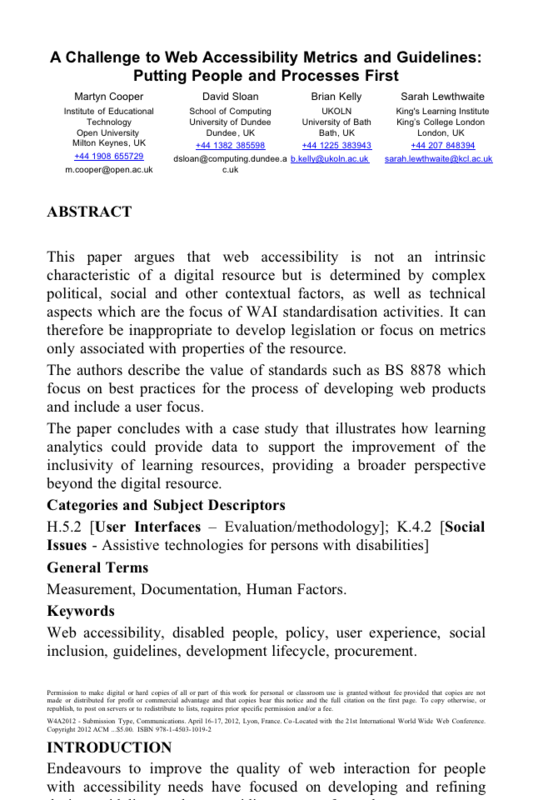 The paper, on “A Challenge to Web Accessibility Metrics and Guidelines: Putting People and Processes First” has been accepted for the W4A 2012 conference, the 9th International Cross-Disciplinary Conference on Web Accessibility which takes place in Lyon on 16-17 April 2012. The paper is the latest in a series of peer-reviewed papers on Web accessibility based on work led by myself and David Sloan, an accessibility researcher based at the University of Dundee. In order to help to maximise the impact of the paper we have made it available from Opus, the University of Bath’s institutional repository. Whilst providing open access to a research paper is a desirable goal, it is still a passive approach which does not necessarily help in seeing the ideas provided in a paper being widely adopted. As part of a pro-active approach to sharing our ideas, myself and my co-authors have agreed to raise awareness of our paper across our professional networks through use of our preferred social media channels. In addition to this post Martyn Cooper has published a post on his contribution to the paper and Sarah Lewthwaite has mentioned the paper on her Slewth Press blog. We can also expect @martyncooper, @sloandr and @slewth talking about the paper on Twitter. In addition to such blogging activities I have produced a 90 second video summary of my contribution to the paper, which, to allow the video to be easily embedded elsewhere, has been published on YouTube and is embedded below. In addition to raising awareness of the paper we are also providing opportunities for the ideas described in the paper, including adoption of the BS 8878 Code of Practice For Web Accessibility, to become better understood by practitioners. EA Draffan, who was a co-author of one of our earlier W4A papers on “One World, One Web … But Great Diversity” will give a plenary talk on Beyond WCAG: Experiences in Implementing BS 8878, at UKOLN’s forthcoming IWMW 2012 event. At the same event David Sloan will facilitate a 90 minute workshop session on Managing the Process of Providing an Inclusive Institutional Web Presence. We also hope that the delivery of the paper at the W4A 2012 event on Monday 16 April will help to raise the visibility of our ideas, not only for the event participants but also by using Slideshare and, we hope, recording the presentation itself. I would be interested in other researchers’ views on approaches to maximising the impact of their work. Is this something which you feel is a fundamental aspect of research activities; is it something to be done, out somewhat reluctantly, perhaps due to departmental REF-related pressures or, alternatively, should researchers have a disinterested view of take-up of their ideas in order, say, to maintain one’s objectivity and detachment? Comments are welcome. Alternatively feel free to complete the accompanying brief survey. Over the past year or so I’ve become aware of the importance of images in blog posts. I noticed this after I started to move away from reading blogs on my RSS reader on my mobile device, which didn’t include images, to use of RSS and Twitter aggregator services, such as Smartr, Pulse, Flipboard or Zite. An example of the interface which I use most mornings on the way to work can be seen. This image shows the Pulse App on my iPod Touch. As can be seen in the display of UKOLN RSS feeds my blog and the blog for my colleague Marieke Guy both feature images taken from the blog posts which can held differentiate posts; in contrast items available in the UKOLN News RSS feed, for which we tend not to provide images, fail to stand out. It was as the importance of such personalised newspaper apps started to become apparent that I decided to make greater use of images on this blog. In this respect I am well behind Martin Weller who, on his Ed Techie blog, frequently includes images in his posts. The thing I didn’t expect was to see such interfaces being provided for desktop browsers. 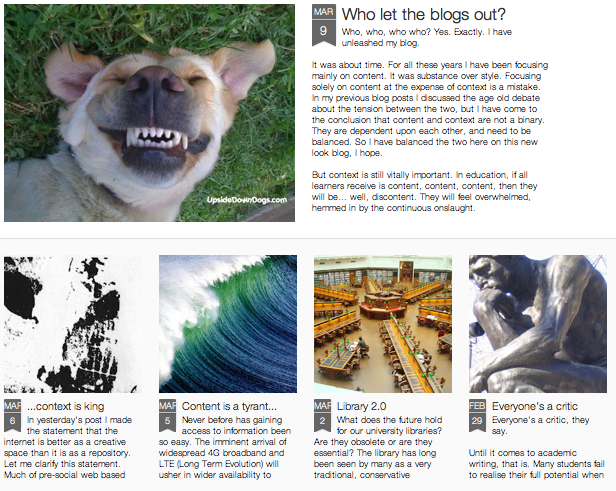 However last week when I followed a link to a post on Library 2.0 on Steve Wheeler’s Learning With ‘E’s blog I found a similar graphical interface, with an image for the most recent post displayed prominently and images for other recent posts displayed underneath. I think it will be interesting to see the way in which user interface approaches developed for mobile devices start to migrate to a desktop environment. For all these years I have been focusing mainly on content. It was substance over style. Focusing solely on content at the expense of context is a mistake. I gave my blog a makeover a few days ago. I invoked one of the new templates that Blogger has just started to offer its users. You can see the difference it has made. 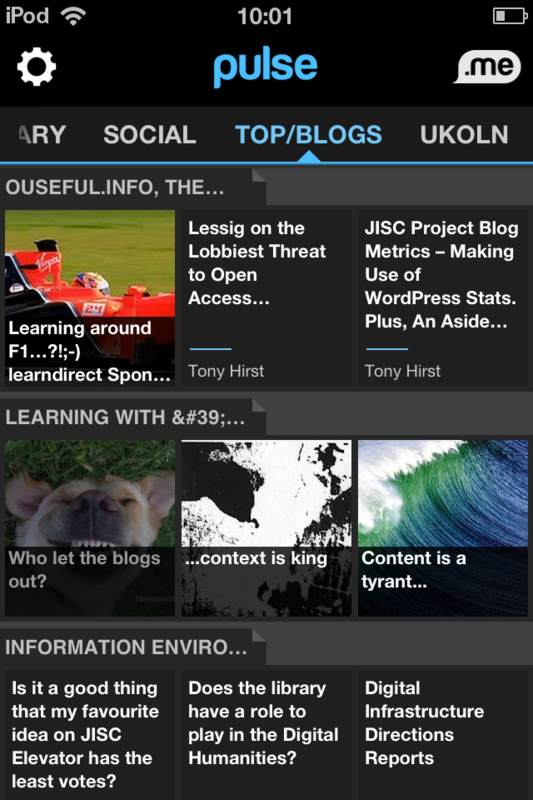 … It holds the content, and presents it in a manner that is more accessible, easy to explore and in a more dynamic way. It will be interesting to see if developments such as this theme, which is provided on the Blogger.com platform, owned by Google, will challenge traditional views on the importance of HTML conformance and Web accessibility guidelines. I would be interested to find out if the content of the blog can be made available to AT tools whilst still providing the new interface for those who prefer this way of interacting with continually the updated content we often find on blogs. I should add that Steve’s blog can be read on my iPod Touch and Android phone using apps such as Pulse. This makes me wonder if we can regard such devices as AT tools for users who may, for example, find it difficult to make use of desktop computers? The goal of this symposium is to bring researchers and practitioners together to scope the extent and magnitude of existing …. metrics, and to develop a roadmap for future research and development in the field. Using numerical metrics potentially allows a more continuous scale for [measurements] and, to the extent that the metrics are reliable, could be used for comparisons. However, it is unclear how metrics can be developed that fulfill requirements such as validity, reliability, and suitability. I’m pleased to say that I’ve had a paper accepted for the online symposium which will take place on 5 December 2011. But what is the subject of the symposium? I have recently published posts about the complexity of metrics for research papers, including issues such as download statistics for papers which are distributed across multiple services and metrics for providing answers to the question of “what makes a good repository?”. Or perhaps the paper concerned metrics associated with use of Social Web services, another area I have addressed in several posts over the past year. Both areas are very complex, with people questioning the validity of current approaches which are being taken to developing metrics which can be used to make comparisons – clearly areas worthy of research into how metrics can be developed and to have a questioning and critical appraisal of approaches which are being proposed. But this wasn’t the area addressed in the paper and in the symposium. As the call for papers points out “conformance to the Web Content Accessibility Guidelines (WCAG) is based on 4 ordinal levels of conformance (none, A, AA, and AAA) but these levels are too far apart to allow granular comparison and progress monitoring; if a websites satisfied many success criteria in addition to all Level A success criteria, the website would only conform to level A of WCAG 2.0 but the additional effort would not be visible.” It seems that rather than having simple four conformance levels, WAI are looking for more sophisticated algorithms which will be able to differentiate cases in which, for example, a Web page contains hundreds of images, none of which contain the alt attributes which are needed to enhance access to assistive technologies and a Web page which also contains hundreds of images, only one of which fails to have a meaningful alt attribute. Currently both pages with fail WCAG conformance, since this requires all images to contain alt attributes. It seem that the goal is a Klout score for Web accessibility, but with the difference that the underlying algorithms will be made public. But just as with Klout there is, I feel, a need to question the underlying assumptions which underpin the belief that accessibility can be determined by conformance with a set of rules, developed as part of the WAI’s model based on conformance with guidelines for content (WCAG), authoring tools (ATAG) and browsers and other user agents (UAAG). It is worth, therefore, making some comparisons between metrics-based tools such as Klout for measuring and the range of web accessibility measurement tools of which the now defunct Bobby tool was an early example. Underlying model Undocumented algorithms based on analysis of Twitter communities, posts, retweets, etc. Based on conformance with WAI model, based on three sets of guidelines, for content, authoring tools and user agents. Conformance, however, focuses only on WCAG guidelines. h-index, g-index, …. Legal status No legal status. Conformance required in several countries. No legal status but may be used to determine research funding. However I do feel that there is value in metrics, whether this is for helping to identify the quality of research publications, online reputation or accessibility of online resources. The difficulty arises when the metric is regarded as the truth, and becomes a goal in itself. So whilst I feel there is validity in publishing details of Klout, PeerIndex and Tweetstat statistics across a selection of institutional Twitter accounts in order to help understand patterns of usage and, I should add, to understand the limitations of such metrics-based tools, I also feel that institutions would be foolhardy to regard such statistics as concrete evidence of value. Rather such statistics can be useful when used in conjunction with other evidence-based parameters. The danger with Web accessibility metrics is that they have been used as a goal in their own right. In addition, sadly, the previous government has mandated conformance with these metrics across Government Web sites. 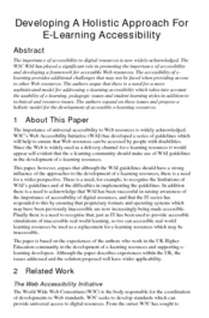 And back in 2004 WAI gave their views on Why Standards Harmonization is Essential to Web Accessibility, which seems to be leading to WCAG conformance being mandated across EU countries. If a proposal on “Why Online Reputation Standards Harmonisation is Essential” was published, especially by the body responsible for the online reputation standard which was proposed as the only standard which should be used, there would be uproar, with, I would hope, the research community seeking to explore limitations in the proposed standard. Fortunately the organisers of the WAI symposium do seem to be aware or criticisms of their approaches to Web accessibility as providing the only legitimate approach. The Call for Papers invited contribution which “may include approaches for measuring ‘accessibility in terms of conformance‘ (metrics that reflect violations of conformance of web content with accessibility guidelines such as WCAG or derivatives such as Section 508) and ‘accessibility in use‘ (metrics that reflect the impact that accessibility issues have on real users, regardless of guidelines)” (my emphasis). The fundamental objection myself and fellow author of our series of paper on this subject, is that accessibility is not an innate characteristic of a digital object, but of the user’s difficulty in engaging with an object to fulfil a desired purpose. The view that all Web resources must be universally accessible to everyone, which underlies pressures for organisations to conform with WCAG guidelines, is a flawed approach. [BS8878’s] goals were to share best practice in the first Standard about the process of accessibility rather than it’s technical aspects. It’s succeeded in helping harmonise the separate worlds of inclusive design, personalisation and WCAG approaches to accessibility. Uptake is always difficult to measure, and it’s still early days for organisations to go public and say they have changed the way they work to follow BS8878. However, some organisations already have including: Royal Mail, beta.gov.uk and Southampton University. And many others are working on it. BS8878 is one of the best-selling standards BSI have ever created – so it’s met their goals. I’ve trained many organisations globally and my BS8878 presentations on slideshare have been viewed by over 6000 people from over 25 countries. There is a need to encourage greater take-up of BS 8878, and I hope our paper will help in describing ways in which such take-up can be measured. But what of the development of new ways of measuring WCAG conformance? As described in a paper on Involving Users in the Development of a Web Accessibility Tool at a cost of over 2M Euros the EU-funded European Internet Accessibility Observatory Project developed a robot for measuring conformance with WCAG guidelines across a range of government Web sites in the EU. As described on the eGovernment Monitor Web site has released the eAccessibility Checker which builds on the EU-funded project and can be found at http://accessibility.egovmon.no/. However looking at the results of a survey carried out last month across a number of Norwegian Web sites it seems that there of a number of problems which are experienced by over 80% of the Web sites! If such tools report a low-level of conformance can’t we then use this as evidence of the failures of the WAI model rather than, as has been the case in the past, a failure in organisations to be willing to enhance the accessibility of their services? On Tuesday and Wednesday I attended the DevCSI’s Accessibility Hackdays – A11y hackspace which was described as “A two day workshop bringing accessibility (a11y) users, experts and developers together to hack on ideas, prototypes and mashups, while exploring the challenges in providing usable accessibility“. Unfortunately I arrived late on Tuesday and so didn’t have an opportunity to join in the discussions which aimed to identify development areas related to accessibility ( for which the Twitter tag “#a11y” is often used). So yesterday I used the development time as an opportunity to identify existing Twitter applications which might be used to support the event. UKOLN’s DevCSI work has a focus on the building of communities. There have been community activities over 2 days. But what evidence do we have of community engagement; sharing and the sustainability of such communities and how do we enable participants to understand, interpret and curate their own communities? I then demonstrated a number of applications and summarised how the applications can help to address the problems described above. I began my mentioning the TwapperKeeper archive for the #a11yhack hashtag which I created on the train on Tuesday afternoon after I noticed that the archive hadn’t been set up. I then showed the output from the Summarizr analysis service for the #a11yhack tag and pointed out that @maccymacx was the top Twitterer and was also mentioned or replied to the most. As she tweeted shortly afterwards” @briankelly preso: #twitterstreamgraphs shows that I’m top of most #a11yhack twitter ratings, should I be worried? :S“. Note I also pointed out that there were only two geo-located tweets, one from Birmingham and one from London. Such low levels of usage has been recorded for many of the Summarizr summaries I had examined, indicated that Twitter is not currently being used to geo-locate tweets. After the demonstration related to the Twitter volume I then demonstrated Tony Hirst’s Web based tool which provided a visualisation of the connections between people who tweeted with the #a11yhack tag (though note I found that I had to enter the hashtag into the search box). As Tony described in a blog post entitled OUseful.info: Using Protovis to Visualise Connections Between People Tweeting a Particular Term this service was developed in April in order to “publish a service that lets folk generate their own network visualisations”. In his post Tony described how “the app demonstrates whether folk recently tweeting a particular term or hashtag all know each other, or whther the discussion going on around the term/tag is taking place outside of an echo chamber“. 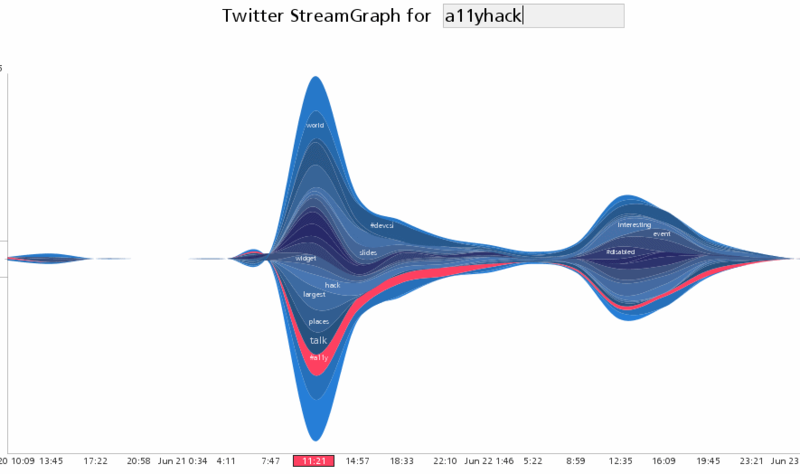 After discussed how the service described above helped to gain a better understanding of the connections between people using the event’s hashtag I demonstrated the Twitter StreamGraph timeline for the #a11yhack hashtag. From this we could clearly see that the peak time for the tweeting had been at about 11am yesterday morning, with a second peak after we had returned from lunch. Perhaps most interesting, however, are the much smaller visualisations of a small number of tweets at 2am (just before the hackers were heading off to bed) and at about 7am (when they were getting ready to start hacking on the final day). I think this demonstrates that such DevCSI events do have a requirement for network access at unexpected times of the day! In a recent post Tony Hirst described A Map of My Twitter Follower Network. The production of the map requires some manual intervention so it was not possible to be able to provide a live demonstration of Twitter networks related to, say, the @devcsi account. However I suggested that since the DevCSI had an important role to play in supporting the development of communities that it might be useful exercise to see the develop of Twitter communities around the various topics areas which have been addressed at DevCSI events. 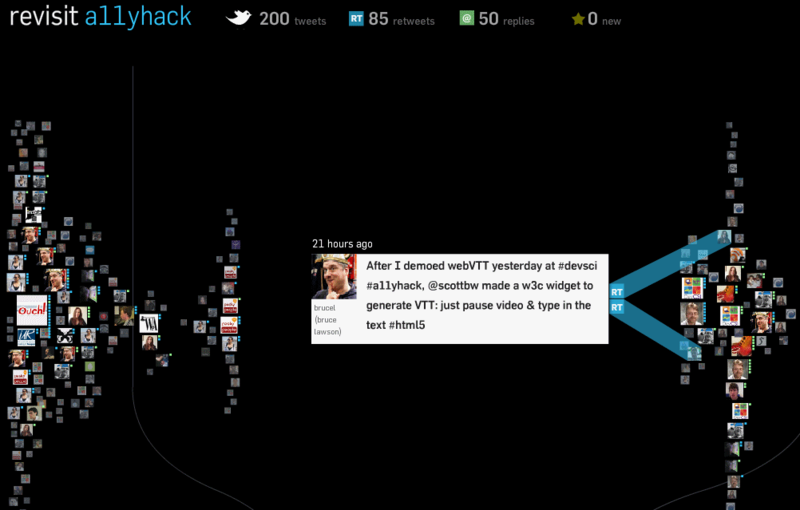 I concluded by demonstrating the Revisit realtime display of #a11yhack tweets (which is illustrated). A point of showing this display was to demonstrate how a wide range of visualisations of Twitter streams can be provided, which can allow users to choose an interface which reflects their personal preferences, rather than expecting every Web-based interface to be universally accessible to all users – as some felt to be the case in the early years in the development of accessible Web sites. Thanks to @mahendra_mahey @SteveALee @devcsi for enabling collaboration, innovation & creativity to flourish at #a11yhack. An example of the collaboration, innovation and creativity was seen when, following Bruce Lawson’s demonstration of webVTT in his invited talk on HTML5, Scott Wilson of the JISC-funded CETIS service developed a W3C widget to generate WebVTT (the Web Video Text Track file format that is under development for solving time-aligned text challenges for video.). Bruce, who was only present at the event on this first day, was alerted to this development on Twitter and shared the news across his Twitter community, as illustrated in the above image. Further summaries about the event should be published shortly on the DevCSI blog. I’d like to conclude by echoing Sandi’s comments on how the DevCSI event helps to support collaboration, innovation and creativity and to give thanks to my colleague Mahendra Mahey, the DevCSI project manager for his willingness to take risks in providing the environment which supports the rapid development environment we saw over the last couple of days and Steve Lee, the co-facilitaor of the event, and wish Steve well in his new venture with the OpenDirective, spin-off company from the JISC OSS Watch service. On 21-22 June 2011 UKOLN’s DevCSI project is organised the #a11y hackspace event, which is described as “A two day workshop bringing developers, accessibility (a11y) users and experts together to hack on ideas, prototypes and mashups, while exploring the challenges in providing usable accessibility“. It seems to be that this event could provide an ideal opportunity for developers with an interest in accessibility to explore solutions and approaches which could be used in the context of the BS 8878 Code of Practice on Web accessibility (which is summarised on the AbilityNet Web site). In a post on Web Accessibility, Institutional Repositories and BS 8878 I have previously described how the 16 steps defined in BS 8878 could be applied in the context of defining the accessibility policies and processes for enhancing the accessibility of institutional repositories. One of the steps is to “Assure the Web products accessibility through production (i.e. at all stages)“. I suggested that this could be addressed by use of tools to monitor the extent to which PDFs hosted in institutional repositories are conforming with accessibility guidelines for PDFs. This suggestion was based on a paper on “Supporting PDF accessibility evaluation: Early results from the FixRep project” which I described in a blog post last year. Might there be an opportunity for developers to build on this initial work, I wonder? If you have other suggestions which could be addressed at the hackday note that a wiki has been set up. Also note that the event is free to attend and the online booking form is open for bookings. I have previously described the limitations of basing an institutional Web accessibility policy purely on conformance with WAI WCAG guidelines. Such an approach, whilst appearing very laudable, fails to address the more challenging areas of enhancing access to Web resources and services for people with disabilities, including the challenges of key institutional activities such as the provision of e-learning for students and of institutional repositories for researchers. The BS 8878 Code of Practice provides a valuable framework for addressing such challenges and, as suggested previously, could be used to provide a policy framework for enhancing access to institutional repositories. However although BS 8878 seems to provide a policy framework which is appropriate for use in the UK, there is still a need for a mechanism for users with disabilities to be able to report access problems and for such concerns to be addressed. The Fix the Web initiative has been set up to enable end users to report problems and for such problems to be evaluated by Web experts and, where appropriate, for such problems to be reported to service providers. If you want to find the new plugin and use it for you or your learners to report any inaccessible sites please download it from http://www.fixtheweb.net/toolbar. You can find out more about making a difference by volunteering your web accessibility awareness and expertise at http://www.fixtheweb.net/being-volunteer. Ensuring the information from the disabled person, though very brief (some of this will come through tweets!) is reproduced in a polite and comprehensible form. Finding the web owner via their website and send the information to them through email or contact form. I know many people involved in institutional Web activities have strong interests in accessibility issues. Here is an opportunity to make such interests and expertise available in a wider context and help to enhance online experiences for people with disabilities. Should you make use of a technology if you can’t guarantee that it will be accessible to people with disabilities? Should you, for example, provide access to videos if you can’t provide captions for the videos? At the recent JISC CETIS Accessibility SIG meeting which I mentioned recently Shadi Abou-Zahra commented that he felt that some of he criticisms I had made of the difficulties of implementing WCAG guidelines were inappropriate as WAI do not address the policy issues regarding implementation of the guidelines – they simply point out that a failure to implement guidelines can result in problems for people with various disabilities. I have to admit that I wish WAI had been much more vocal in making this point since many public sector organisations (including the UK Government) have stated (or, indeed, mandated) conformance with WCAG guidelines without giving any caveats. But let’s acknowledge that although there may have been communications problems in the past we are now in a position to exploit WCAG and other guidelines in a pragmatic and achievable way, with the BS 8878 Code of Practice now providing the policy framework to guide us. What can be done if you wish to host videos and feel it is not feasible to provide captions? This may be because ownership of the videos is devolved – perhaps large numbers of students have taken videos of their graduation ceremony and these are being hosted (or linked to) from the institution. Or perhaps, as has been the case at a number of events for developers, researchers and practitioners video interviews were made with participants and speakers in order to provide potential attendees with an authentic perspective on what to expect at the event and the costs of just-in-case captioning can’t be justified? The BS 8878 Code of Practice recognises that accessibility is not always easy – or indeed possible – to implement. The important thing to do, therefore, is to document policies and processes. But in addition there is a need to understand that technological developments may help to address accessibility issues, so that resources which are not accessible today could be made accessible tomorrow but only if those resources are available. An example of this is the iTitle Twitter captioning service which enabled a Twitter stream to be synchronised with a video stream on popular video-streaming services such as YouTube or Vimeo. An article in The Register does point out some limitations in th automated transcriptions: “Automatic captions for a 14-year-old’s video diary: nigh incomprehensible” but then goes on to add “US President Obama’s weekly address to the nation: works pretty nice“. But what are my experiences? Do I sound like a 14 year old or President Obama? Generating the automated captions was trivial and, as can be seen in the image below, the system could understand that I was speaking English. But what has been transcribed as “acceptable snow” was actually me saying “it’s a cancerous cell“! We therefore can’t say that YouTube’s automatic captions have solved the problem. But it strikes me that the quality of the captioning is likely to improve as algorithms improve, additional processing power is provided and, perhaps most importantly, the system begins to recognise regional accents and also individual speaking patterns. It should also be noted that, as described on the YouTube Web site, the automated captioning service creates a captions.sbv file containing the captions and the time stamp. As this is a text file it can be edited using a simple text editor so that if, for example, much of the captioning is correct but the odd word has been transcribed incorrectly it would be possible to use the automated conversion for the bulk of the conversion work. Should we not, therefore, be providing YouTube with a wider range of videos containing our various regional accents in order to enhance the automated analyses? And will a failure to upload our videos result in a failure to enhance accessibility for tomorrow’s audiences? And if we have lecturers who speak with a clear and distinct English accent (unlike my Scouse accent with traces of the years spend in Yorkshire, Newcastle and the East Midlands) and videos of their talks are successfully captioned, wouldn’t if be unreasonable to fail to provide this service? Let’s remember that UK legislation expects organisations to take reasonable measures – isn’t uploading videos in order to enhance access a reasonable thing for organisations to be doing now? As mentioned in a post entitled “A Grammatical View of Web Accessibility” on Monday I gave a talk on “BS 8878 and the Holistic Approaches to Web Accessibility” at a CETIS Accessibility SIG meeting held at the BSI HQ in London. My talk described the background to the development of the holistic approach to Web accessibility and how this approach relates to the BS 8878 Code of Practice on Web Accessibility. When I listened to Jonathon Hassell’s talk on “BS 8878 and the Feedback Process” which preceded mine it was clear that BS 8878 provides a very good implementation of the ideas which myself and fellow accessibility researchers and practitioners have developed since 2005. Our initial concerns (described in more detail in a paper on “Forcing Standardization or Accommodating Diversity? A Framework for Applying the WCAG in the Real World” which is available in PDF, MS Word or HTML formats) were based on a realisation of flaws in the WCAG 1.0 guidelines and a growing awareness of the limitations of the WAI model, which is dependent on full implementation of WCAG, ATAG and UAAG guidelines. The WAI guidelines (and the WCAG guidelines in particular) should therefore be regarded as a target to aspire towards if they are appropriate to the intended use of the Web service and the target audience and the guidelines can be implemented by taking reasonable measures, which will be dependent on factors such as the scope of the service, your available resources and budgets and the maturity of the technologies you intend to use (don’t, for example, expect that a W3C standard such as SMIL will necessarily provide an accessible solution as support for the standard is low). The WAI guidelines should therefore be regarded as a set of technological best practices. However such guidelines are useful in helping to make the, sometimes difficult, choices of the technologies to be chosen, the levels of accessibility to be provided and ways in which such accessibility support can be sustained. This is where BS8878 can provide a solution by outlining 16 stages in the process of developing accessible Web services, including the process of deciding which WCAG guidelines may be appropriate and how they should be deployed. It struck me that the BS 8878 is an example of the saying I heard many years ago: “There isn’t a problem in computer science which can’t be solved by adding a level of redirection“. In this case the areas in which WCAG fail to provide an appropriate solution can be addressed by providing a standard which enables the scope of WCAG’s usage to be defined. Finally I should add that a video of my talk is available on YouTube and embedded below. Note: If you wish to view the video you may find it useful to view the slides which are available on Slideshare and embedded below. This link was added shortly after the post was published.